HOD 75 was new to Western National in 1949. It has a Duple C29F body on the Bedford OB chassis, and the first view shows it in the Southsea rally on 8 June 1980. In this view it is in the livery of Porters of Dummer, near Basingstoke. This second view, taken in The Broadway, Winchester, and shows it in the markings of Mervyn’s Coaches of Innersdown, also near Basingstoke. It is about to pass NXL 847, AEC Regal from Eastern Belle. The date is 1st January 2009 and it’s another King Alfred running day. In case anyone is (a) not familiar with the area and (b) interested, Dummer is the home village of Sarah Ferguson, Price Andrew’s "ex". Is this the same OB that turns up in all those wartime dramas pretending to be ten years older than it is? Not ten years Ronnie. It was in Foyles War from 1941/42, and I think Miss Marple – So only seven years ish. 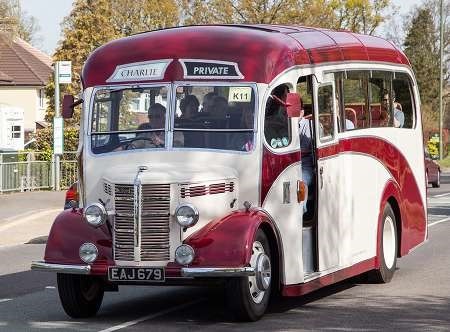 I’m pretty certain that was the exact same coach that used to take us to school there was two that took us and Porters rotated them sometimes we had the vintage one in the photo and other times we had their ultra modern brand new one. 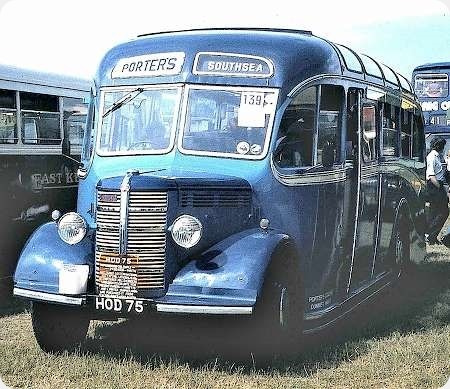 LTA 752 is a Bedford OB with Duple B27F body, new to Western National in 1950, but seen here in Lincolnshire colours as a ‘semi toastrack’ for seafront duties at Skegness. The first views shows it in winter guise, while the second view shows it in summer guise. The first view, taken on the 1st January 2009 shows it visiting the King Alfred running day in Winchester, while the second view shows it in the Alton rally on 18 July 2010. I understand that, by 2012, it was with that very well maintained historic fleet of Lodge, High Easter. Like many Sheffielders at the time, the Dickinson family had holidays in Skegness. 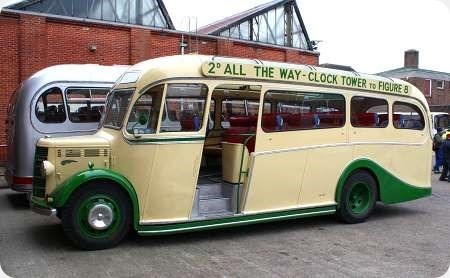 Four of these OBs were employed on the Skeggie sea-front service. Two were open both sides, the other two were only open on the nearside. Numbered 2091/2/3/4, the one pictured was 2094 at the time and came to LRCC, along with 2091, from Western National. 2092/3 came from Eastern National. For this young enthusiast they had to be ridden on each holiday. LTA 752 is indeed with Lodge, Coaches of High Easter. lots of pics of it on Flickr. Oooh! I’d have insisted going to Skeggie as a child rather than as an adult if I’d known these beauties were doing the seafront duties! And all for 2d each way! The other plates were as follows;- 2091 -HUO 692; 2092 – ONO 88; 2093 – ONO 89. The first from 1947, the other two 1950. All these three to LRCC in 1958 I believe. Just think 110 miles South and 2d to go "All The Way" would have a quite different connotation. I’ll keep the day job! A rare sight today is this Bedford OB. Rare because it carries a Plaxton body rather than than the ubiquitous Duple Vista which survives in greater numbers. 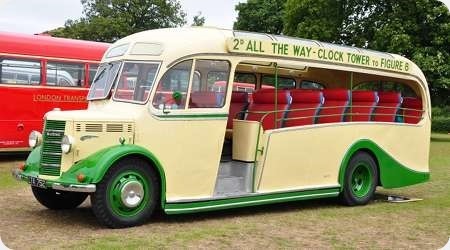 Chassis number 134198, body number 579 was new to C W Blankley (Gem Luxury Coaches) Colsterworth in June 1950. 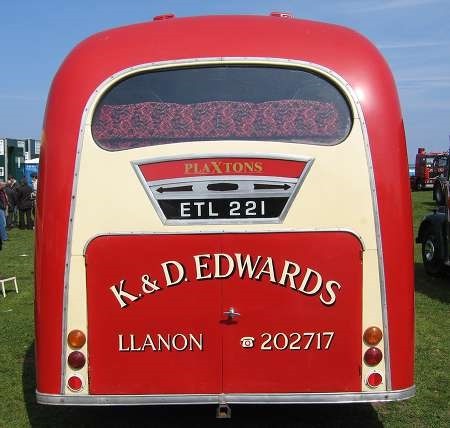 It is now owned by Mr Ken Edwards of Llanon in Cardiganshire and who shows it with pride at many events near and far every year. This view sees it in August 2016 at an event organised in honour of the memory of Stan & Wyndham Rees, formerly of Midway Motors, Crymych. Appropriately this well-attended event was held in fields directly opposite Midway’s depot in Pembrokeshire. Now this is a real beauty and an interesting one because the door is positioned further forward than on the contemporary Duple Vista. Judging by the small window ahead of the door, it would appear that this coach didn’t have a front seat beside the driver. I may be in a minority but I’d say this Plaxton body beats the Duple version on looks and style but without that much coveted front seat, I’m afraid several points must be deducted! I’m sure someone will know the actual dimensions but when seen alongside the Duple version, Plaxton’s offering was noticeably taller than the other. My personal opinion of the design is that the ‘fin’ shaped moulding towards the front spoils what is otherwise a decent design. Sorry, Chris B – rare as it is, I am glad the Duple version was the most common. Somehow the Plaxton version just seems wrong. The deep windscreens give it a goggle-eyed appearance and the heavy streamlining makes the rear end look to be sagging. No doubt to save money, Plaxton seemed to have used a full-front, forward-control body design and adapted it to a normal control chassis. Duple, on the other hand, designed the Vista from scratch, with all the right proportions. Mind you, if this turned up to offer me a ride, I’d jump on board! I agree with Paul, the Plaxton design was not as attractive as the more popular Duple Vista, and did not have the front seat beside the driver. 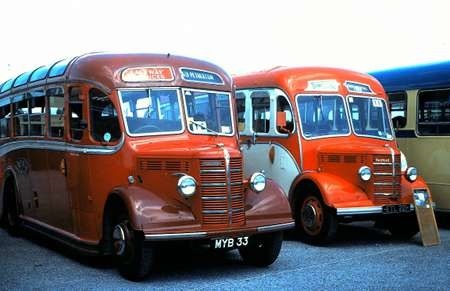 I am not sure how many Plaxton bonneted ones were built and they went over to the even more ugly full front version which retained the original radiator grille & headlamps, none of these according to my records have survived. Despite being a huge fan of older Duple body designs, including the Vista, I have to help balance this thread by saying that I think the Plaxton K3 body looked really well on the OB, even preferring it (only just) to the Vista – a bit less dumpy and with neater windows, though the Vista may have looked slightly better from the back (not appreciable on these photos). It’s of course all in the eye of the beholder, as they say. Although it could be argued that the Vista rear with twin windows and other aspects like fake bumper is a little more fussy, I prefer it to the Plaxton, which is rather bland, some might argue plain. However, liveries can make a real difference to a PSV’s looks, as we all know. Yes, the rear view has clinched it for me. Duple wins with the pleasing windows, the more attractive mouldings and the colour break at the waist level, rather than, awkwardly, reaching to the floor with the roof colour. Here’s another comparison for the discussion. MYB 33 and ETL 221 are seen – front ends only – at Weymouth on 1 July 1979. I have to agree on one major point with Petras409. While I am a great admirer of both the Duple and the Plaxton designs – and their quality construction – I’m the first to acknowledge that the strange "archway" effect at the rear of the Plaxton is very distinctly "prewar" – and the same applies even on the full size versions. A real case of "spoiling the ship for a ha’porth of tar." I see that most here prefer the Duple rather than the Plaxton design for the OBs illustrated. I do tend to agree, but I do wonder whether it is because the Duple was so widespread, whereas the Plaxton was less common? I wonder what we would be saying if the quantities produced were reversed, and we would measure everything else by the Plaxton design? Would we be saying the Duple was too fussy? Just food for thought. . . The frontal design of the Duple blends the bodywork neatly into the taper of the bonnet in a way that gives the design a classic, unified appearance. 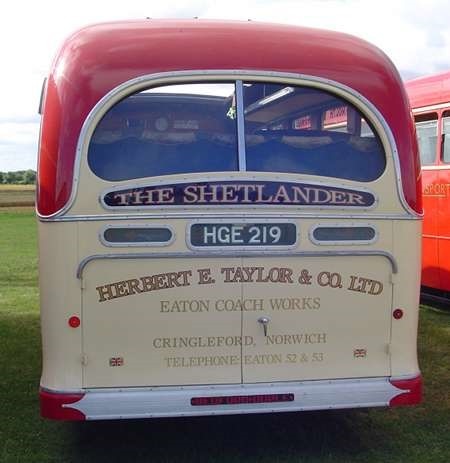 On the Plaxton, the bulkhead behind the engine forms a flat projection beyond the bonnet sides in a manner adopted by some other coachbuilders on bonneted chassis, Strachans, for example. 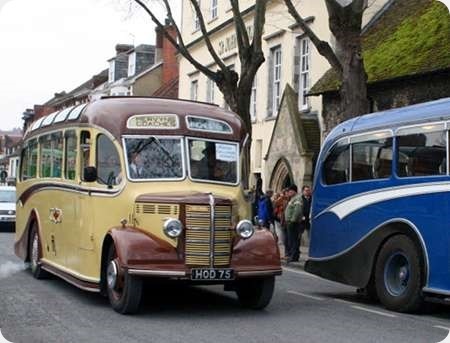 Those were the days when Duple bodies were in the forefront of styling and construction. From the later 1960s they were the amongst the ugliest things on the road. I am trying to find out a little more about C W Blankley and Gem Luxury Travel. Does anybody know anything about them? This is from memory only, and should not be considxered "gospel". I believe that some, if not all, Gem operations were acquired by Fairtax of Melton Mowbray, run by John Penistone on behalf of Midland Fox, during the latter companies widespread expansion scheme immediately after privatization. I seem to remember some marketing-led "Gem-Fairtax" references, but as this was about the time of my departure from Midland Fox to pastures new at Shearings I cannot be certain. Further to my previous comment I have just read on a local history page comments by Mrs. Blankley about the end of the company. She said that post-deregulation it was impossible to sell bus businesses as "anybody" could start up and she sold the coaches. I surmise therefore that Fairtax acquired the goodwill attached to the name. I have no recollection of any vehicles being taken over by Fairtax , but they could have "after my time". It would be interesting to know what happened to their contracts and private hire book. In British Bus Days there was a low-cost unit based in London Country area called Gem-Fairtax Ltd,whose head office was 30 Millstone Lane,Leicester (the Midland Fox head office). Coincidentally (?) there was an unconnected (?) Fairtax operation based at the former Blands of Stamford depot, which was run (coincidentally?) by one Brian Garrett, the former owner/manager of Wreake Valley Travel which was a Midland Fox subsidiary after an anti-competitive buy out in early deregulation times. By the time of the new Fairtax operation the original (Midland Fox) Melton Mowbray Fairtax operation had been remerged into Midland Fox. The "new" Fairtax had a number of minibuses from similar sources to some of Fox’s second-hand purchases which may or may not have been ex Midland Fox. It all seems somewhat incestuous, and bearing in mind British Bus ( or rather Drawlane it’s immediate predecessor) and it’s financial methods not at all strange. All this information is available on various different web sites,and while the connections might be somewhat tenuous, it is not difficult to draw certain conclusions which may or may not be correct. Bear in mind also that Steve Telling (of Tellings-Golden Miller) was involved with Midland Fox at this time, that could explain the Gem-Fairtax connection in Surrey. Tellings-Golden Miller were actually the purchaser of V&M Grendon/Hills of Stockingford and NWP Travel (Powner) of Hinckley which were lumped together in one operation and subsequently disappeared without trace although the Powner premises were used by Midland Fox’s Hinckley minibus unit. Cecil William and John Clifford Blankley began trading as the Gem Bus Service in 1926 with market day services to local towns using a second hand Chevrolet. Later a daily Grantham to Melton Mowbray service was added. 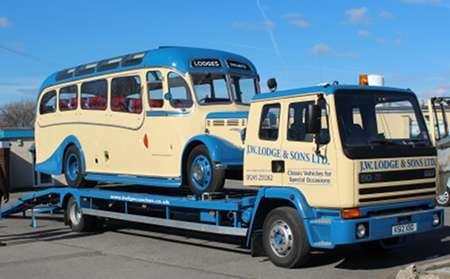 Lincolnshire Road Car acquired the business with five vehicles on February 28th 1935 and the brothers then became drivers for LRCC at the newly opened outstation at Colsterworth. 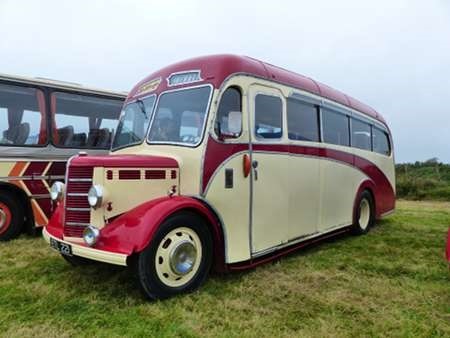 During the war Cecil Blankley restarted as Gem Coaches with a second hand Commer. 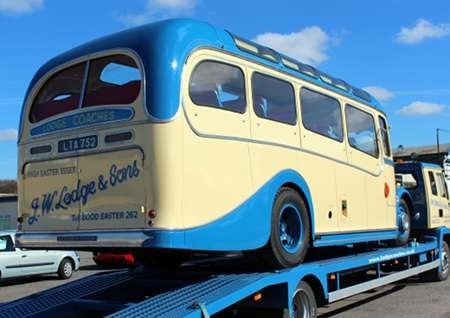 A quite significant fleet was built up with a fair number of coaches bought new. A couple of other titbits. Midland Fox bought Blands of Stamford the location of the "new" Fairtax. The Melton Mowbray operation traded as Melton Bus and Coach for a time. The "new" Fairtax morphed into " Fen Travel" and competed strongly with Viscount. It’s opening fleet included 2 VRs, and 2 ex Barton Leopards – all from the Midland Fox fleet. While beyond the scope of the interests of people reading this website, it is quite probable that the financial manoeuvring of this labyrinthine is possibly even more interesting than the vehicles operated!